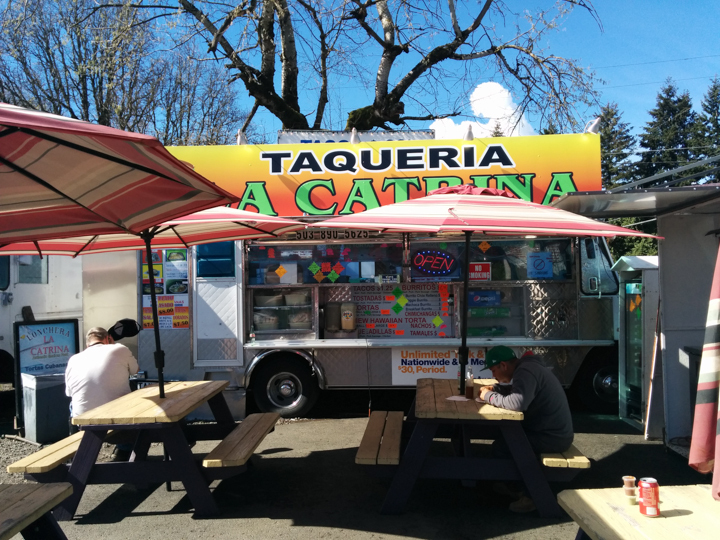 Taqueria La Catrina is a food truck located at 9603 SE 82nd Ave, South of Johnson Creek, North of Otty Rd. It's pushed back from the street between a McDonalds and a cigarette store, across from the Best Buy/Babies R Us. So yeah, basically it's in the center of Hell. You'd never know it was there if you didn't have spies scoping out places for you (thanks Ben). 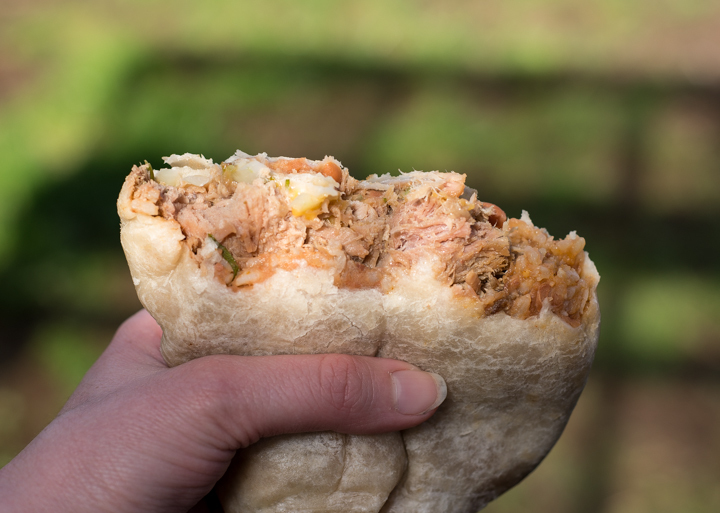 Hot and hungry, frazzled and fatigued, lugging my ponderous plastic bag of burrito across the dusty lot to my car, I felt a bit like Sisyphus. This day, the heat, the incessant cars motoring down 82nd, the chore of ordinary life, weighing down on me like a perpetual game of boulder tag. But, I hopped in my car and high tailed it home, to my haven. 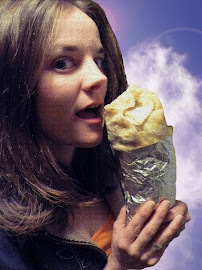 Just me with a giant meat filled tube of love as my copilot. 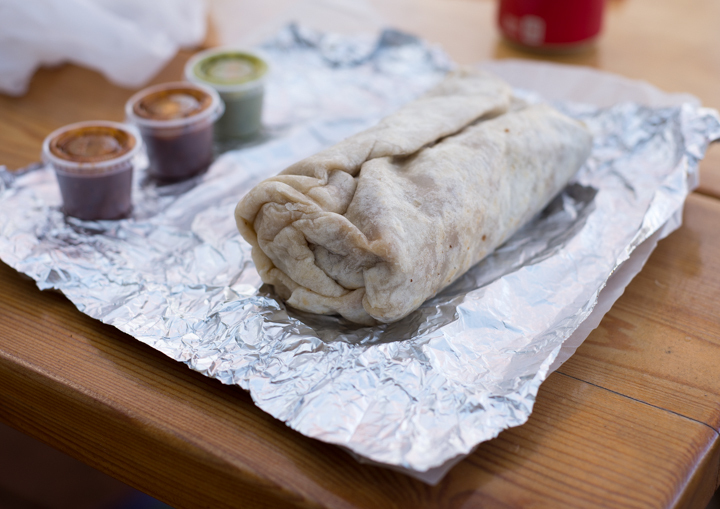 Slowly, the wrapper unfurled and out rolled a plump beefy bulldog of a burrito- wrinkly and solid. Upon first bite, a mouthful of soft juicy pig meat filled my food hole. It was tender and flaky, yet the texture could have been more dynamic- it lacked that crisp braised edge I love so dearly in my Carnitas. The dispersion of ingredients was nice (plenty of meat), but there was too much onion. The astringency overwhelmed the porky saltiness my cheeks so yearned for. Cheese and beans were tasty. 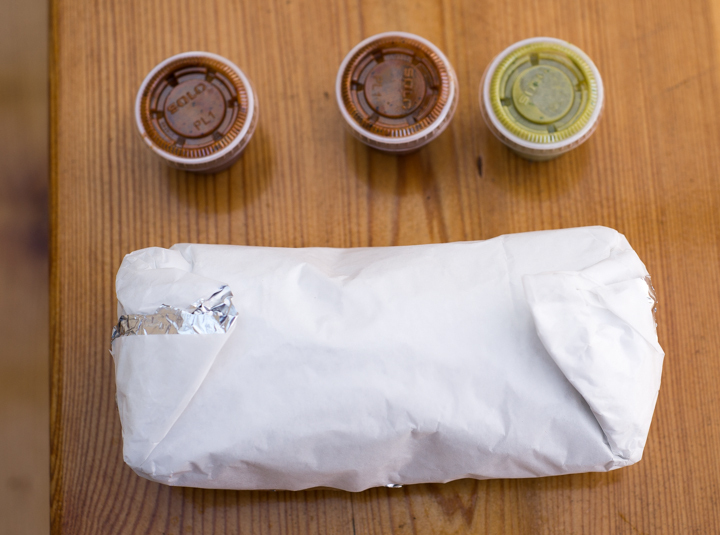 It was dense and heavy, and as my belly filled, the heaviness of existence floated away and my meltdown was staved off for another day. Sure, the next time around.